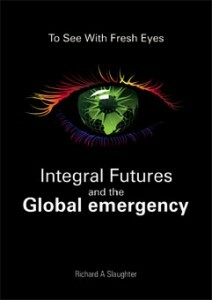 This new book will be published by Foresight International in early 2012 in soft cover and pdf, with eBook to follow. Following the publication of The Biggest Wake-Up Call in History I decided to re-visit my personal archive of previously published articles, papers and chapters. Over a couple of months I pulled together several folders on a number of topics, one of which was Integral Futures. That was as far as it went until I read an outstanding paper by Terry Collins and Andy Hines on The evolution of integral futures – a status update (World Future Review, 2, 3, 2010 pp 5-16, WFS, Bethesda, M.D.). Here is how they described it. Integral Futures is an approach to futures studies that adapted Ken Wilber’s Integral Theory to futures practice. Integral Theory is not exclusively the domain of Wilber, but he is its leading exponent and was central in popularising the idea. The domain is expanding with new voices and ideas increasingly contributing to the conversation. A key concept underlying Integral Theory is to include as many perspectives, styles, and methodologies as possible when exploring a topic. In their overview they provide a valuable timeline of work carried out by various people over a decade or so and, in that light, it seemed to me to be time to pull some of my own contributions together and to make them available in one place. This I’ve now done. Andy Hines has been across these developments since he visited us at the Australian Foresight Institute a year or two after teaching had commenced (in 2003) and has proven to be a discriminating and clear-eyed participant observer. So I was particularly grateful that he provided us with a Foreword to the new book. It is reproduced below with his permission, along with my own Introduction and a list of Contents. In making this work newly available I’m not expecting that it will be a best seller. I do hope, however, that it will be of some value to those who are interested in new and empowering perspectives that can and are being brought to bear on the global emergency. In my own case some of the emerging concepts, methods, perspectives and so on have certainly provided me with ‘fresh eyes’ and many new insights. Let us bear in mind, however, that integral theory, integral futures – futures of any variety at all – are of little use unless they help to shed new light upon, motivate new actions to deal with, the new realities that surround us on every side and challenge us to our very core.